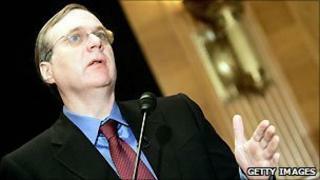 Microsoft co-founder Paul Allen has had his lawsuit against a number of tech and online retail firms thrown out. In August, Mr Allen claimed the firms - including Google, eBay, Apple and Facebook - had infringed patents held by his firm Interval Licensing. But a federal judge said Mr Allen had failed to "indicate with any specificity" which products violated his intellectual property rights. A spokesman for Mr Allen said he would be filing an amended complaint soon. Spokesman David Postman also called US District Judge Marsha Pechman's decision "purely procedural". Others firms named in the lawsuit were Yahoo, Netflix, AOL, Office Depot, OfficeMax and Staples. Mr Allen said the firms had infringed a number of web technology patents held by Interval Licensing. The patents concern using web browsers to find information; letting users know when items of interest appear; and enabling adverts, stock quotes, news update or video images to pop up on a computer screen while the user is engaged in another activity. Interval had not named a precise figure for damages. Mr Allen co-founded Microsoft with Bill Gates in 1975, and later started Interval in 1992. At its height, the company employed over 110 scientists, physicists and engineers. Mr Allen, who made billions of dollars from his Microsoft shares, recently pledged most of his $31.5bn (£19.8bn) fortune to charity. Last year, he revealed he had been diagnosed with non-Hodgkin's lymphoma.